The ABEM Terraloc Pro 2 is a versatile seismograph that can be used with any type of seismic accessory for every possible application. ABEM Terraloc is adding a new seismograph to the family, which further increases the quality with improved stability and enhanced user experience. 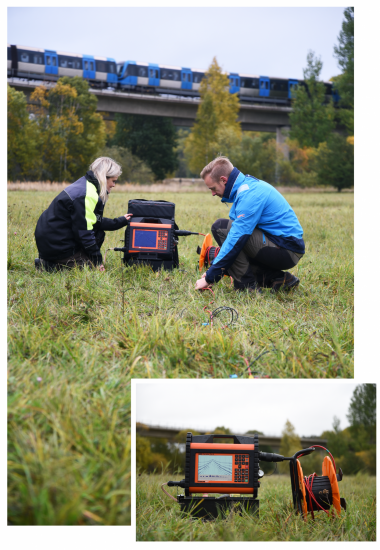 Terraloc Pro 2 seismograph is a great companion for almost all seismic applications whether it is as MASW or reflection survey, cross-borehole testing, or a marine refraction investigation. Typical applications for the Terraloc seismograph instruments are depth to bedrock, bedrock quality, soil stability studies, finding fractures and weak zones, and geological mapping. In all these applications the seismograph is triggered by ground vibrations created by an energy source. Time is then measured accurately until the ground vibrations have propagated through the ground and can be measured by geophones connected to the seismograph. But above all – an upgraded up-to-date user interface that will improve the user experience of the seismograph. The Terraloc Pro 2 provides improved new functionality in conjunction with the best of the previous version − all wrapped together in one efficient solution. The ABEM Terraloc Pro 2 is a standalone seismograph and comes with a built-in computer, data storage, measurement channels and user interface. Measurements are conducted using a graphical interface with a look and feel that is familiar. The seismograph is enclosed in an aluminum casing that is rugged and robust, meeting IEC IP 66 classifications so that measurements can be made in all situations and environments. ABEM Terraloc Pro 2 seismograph is equipped with GPS, WiFi, Ethernet, USB, and VGA. If needed, the ABEM support team can remotely connect to the instrument, regardless of where the seismograph is situated. The ABEM Terraloc Pro 2 seismograph can be configured with up to 48 channels in one unit, allowing for many sensors and resulting in high resolution of data. If more channels are needed, several units can be connected to gain more channels. The cutting-edge technology in the design of the measuring channels gives an outstanding resolution of the measured signal both in terms of time and amplitude. The result is incomparable data quality. Display: 8.4“ Active TFT LCD, full color, daylight visible, 800 x 600 res. All types of accessories can be connected to the ABEM Terraloc Pro 2 seismograph, and solutions can be completely customized to every need. We can supply high quality cables for land, marine and borehole measurements, and geophones suitable for any type of seismic method. Different types of trigger solutions and energy sources can also be configured.